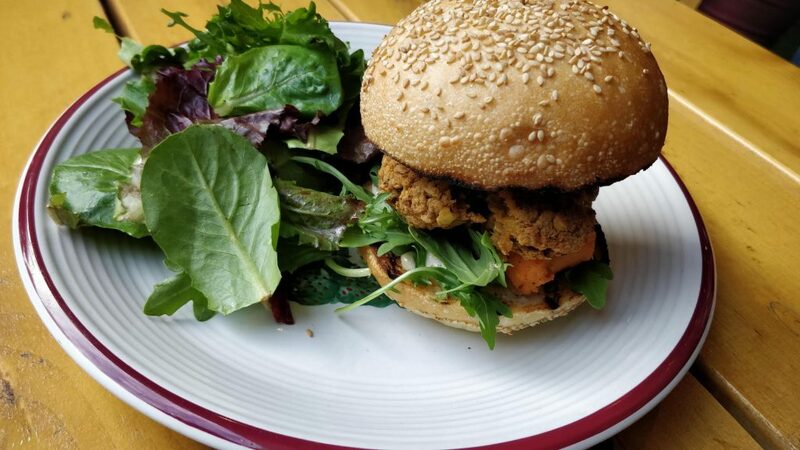 Toronto, ON – Vegan options at Farm’r – vegan in your city. 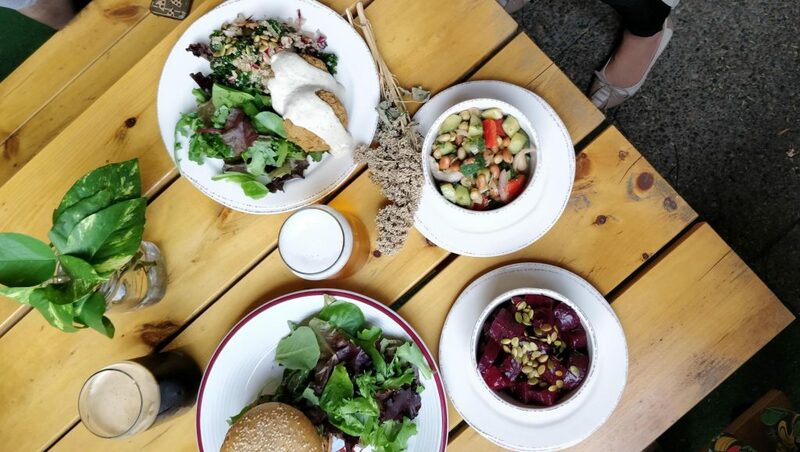 I recently had the opportunity to visit Farm’r, a local procurement centring, seasonal, farm-to-table style restaurant on the Esplanade. They have a great covered patio outside, and bright cheerful indoor seating, with great lighting. But what I really want to talk about is the food – because I liked it. A lot. We had the opportunity to try a variety of dishes, take pictures, and chat. 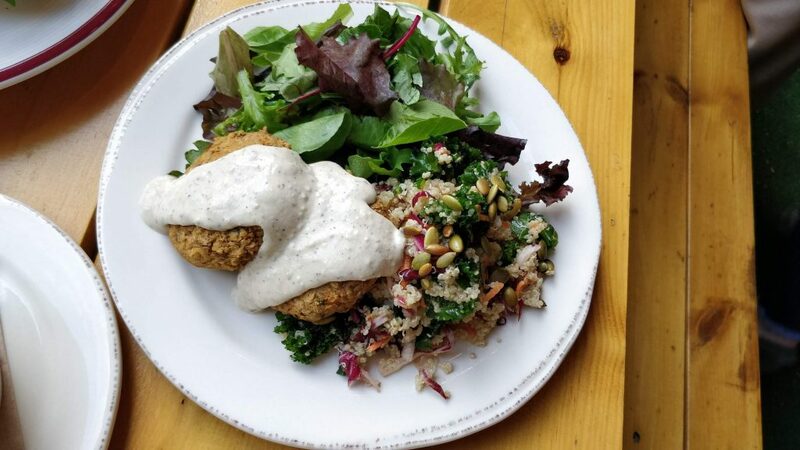 One thing I love is hearing about food from the chef involved – and I was happy to hear a bit from Chef Kyle Webster on what each dish was about – he seemed especially keen on the Ontario grown quinoa and kale salad, so I was very excited to try it. Did you know that folks are growing quinoa in Ontario? I didn’t – while I knew about an initiative in another part of the country, finding out it is being grown right here is pretty cool. So the lentil and chickpea fritters were lovely with the tahini gravy – do not skip the gravy though, they’re made for one another. I can’t help but think of how much my toddler son would love these as well – and Farm’r seems like a kid friendly spot too, which is a bonus if you’re looking. 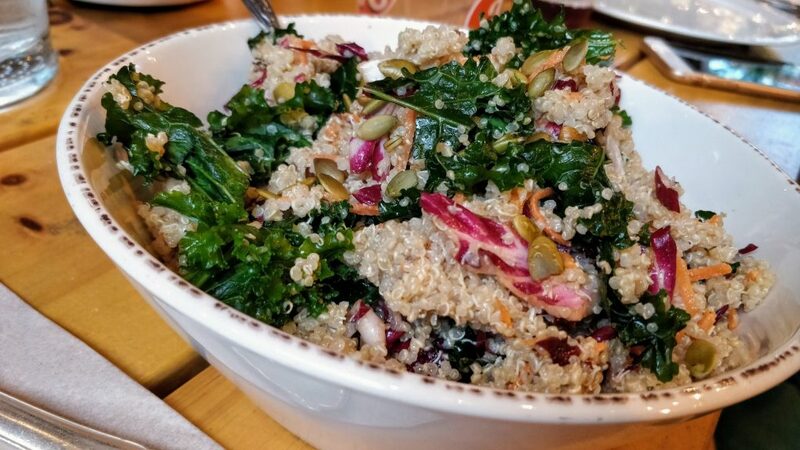 The quinoa and kale salad was hearty and satisfying and had large flavourful quinoa seeds, I’d recommend trying it as a side or in a sides trio plate. 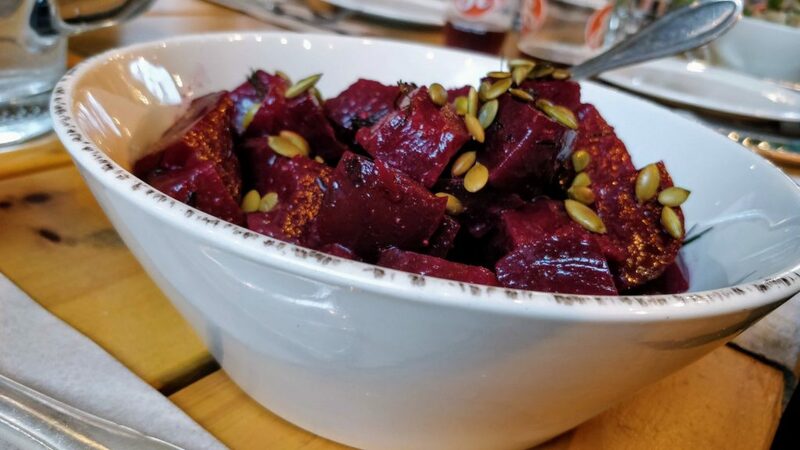 And finally, I’m not a stranger to beets, especially roasted ones, or basically beets in any form, but if you’re beet curious or ambivalent, I suspect this would be a great place to try them for the first time because this dish highlights the very best beets have to offer, in one of their ideal preparation methods. This typically comes with feta, but ask them skip it, you’re not missing anything. Time to love beets. I enjoyed this spot a lot, because the food is delicious, and because it authentically hits some of my points of interest and asks questions like: where does food come from, who helps it grow, how far does it travel, is it ethically produced, who makes this? I love places like this, because they talk and think about accessibility of “good” food and what that might look like. Check it out for yourself. baby related stuff: they have high chairs and a changing table in their washroom. But in short, location is accessible with a gender neutral washroom, but does not have an assisted door to get in. Disclosure: Food was free as part of JoJoInstameets, but this is my honest opinion, and I'm blogging about it only because I liked it.